Four (4) independently controllable irrigation programs, with five (5) selectable start times, for a total of 20 possible irrigation cycles per day. Runtime(s) for each station can be set from 1 minute to 9 hrs 59 minutes per station, in one-minute increments. Quick Station(s) programming to allow rapid programming of an entire block of stations, with the same runtime. Water Days for each program can be based on a seven-day cycle or a skip-by-day cycle, which allows a program to skip from 1 to 30 days between watering cycles. The water days can be restricted with the selection of ODD/EVEN calendar days. Manually activated system check/syringe cycle to sequentially run each station for a user selectable time, with a range from one minute up to nine minutes. Manually activated program cycle to execute a program independently of its programmed start time and water days. Manually activated station cycle to operate a single station for a selectable period of time from 1 minute to 9 hours 59 minutes. Programmable Master Valve to utilize and control a Master Valve on a per program basis. Configurable Master Valve Type to select either a Normally Open Master Valve or a Normally Closed Master Valve. Programmable pump independent of the master valve on a per program basis. Programmable stacking or non-stacking operation of the programs. In the event that programmed start times either within a program or between programs should overlap, or coincide, the controller can either be programmed to sequentially execute one program after the other program has completed (Stack Mode) or to simultaneously execute all programs as their programmed start times occur (No Stack Mode). Programmable delay time between station execution. The programmed delay time can be between 0 to 255 seconds (4 minutes 15 seconds). This capability allows slow-closing valves to completely shut off, before the next valve turns on. Percentage adjustment on a per program basis to allow an increase or decrease of all station runtimes within that program. The percentage shall allow adjustment from 0 to 300% in 1% increments. Programmable rain shut off in order to delay the start of irrigation after a rain storm. The controller shall not water during the programmed delay period (from one to seven days). After the delay period has expired the controller shall return to the automatic mode of operation. Manual Rain Switch (Automatic Watering - No Watering) provides a means of quickly turning off all irrigation programs without disturbing the stored program(s). When the switch is placed in the No Watering position the display shall show "RAIN OFF"
Connectivity for any one of the following: rain, moisture, or freeze sensor device. The enabling of this device can be performed on a per program basis. When the sensor is "active" irrigation shall stop and the display will indicate that the sensor is active. This feature allows non-irrigation programs to execute independent of this device. Selectable cycle and soak irrigation programming or conventional programming on a per-program basis. Programmable cycle runtime, Max Cycle Time, and Soak time on a per station basis. Automatic minimization of the water window by intelligently scheduling station starts when other stations are satisfying their SOAK TIMES. Controller supports Quick Station programming in the Cycle and Soak programming mode. * The controller provides a display of the total runtime of the program using the REVIEW feature of the controller. The cycle and soak feature intelligently displays the total runtime of the program, the controller considers all soak delays, optimized program features, water budget percentage and inter-station delays. Optimized water savings. Re-calculated station run times are executed to the nearest second. Easy to understand and use keyboard layout, provides ease of use during programming and review. Multiple displays provide a simple way of programming and information review. During program execution the controller shall display the executing program number, the flow in GPM, and the station runtime countdown in hours, minutes and seconds. Programmable Controller Security Access code to prevent unauthorized use or modifications to be made of the controller's programs. This feature is enabled by entering a security access code from 1 to 4 digits in length. Review key to display all program parameters on a per program basis. Successive invocation of the key shall display program parameters one by one. Depression and subsequent hold of this key shall allow rapid review of program parameters. Programmable audible alarm. When enabled this alarm will "chirp" once every six seconds for either an electrical field wire fault or any flow fault condition. The alarm will continue until reset by the user. Automatic field wire fault detection enables the controller to sense a short in the field wire and instantly turn off that station. The display will report the fault condition any time a field wire fault occurs. Additionally an audible alarm will "chirp" (if enabled, once every six seconds) until it is reset. The controller will automatically advance the fault station to the next programmed station. 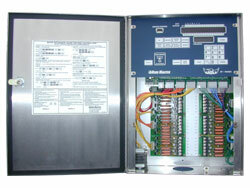 Built-in self-test allows you to test various internal circuitry utilizing built-in test capability. Non-volatile memory to retain the program(s) and controller information during power outages or seasonal shut downs. This information is maintained indefinitely. A "real time" clock with non-volatile backup to maintain the actual date and time during power outages without the need of batteries. This eliminates the need to reprogram the clock every time there is a power outage. Advanced circuitry to automatically monitor internal voltages and reset on-board microprocessor circuitry during power "brown-out" or error conditions. Intelligent resumption of program execution after power outages to ensure that program starts are not lost. The controller intelligently schedules irrigation after any outage while preserving the original water window. Automatic detection of main line water breaks. Upon detection the controller shall: shutdown all active irrigation, energize a normally open master valve (if selected), condemn any future start times, trigger audible and visual alarm indicators. Automatic detection of unscheduled water flow. Upon detection the controller shall: activate the normally open master valve (if selected), condemn any future start times, trigger audible and visual alarm indicators. Automatic detection of upper stations flow limit. Upon detection the controller shall: turn off the fault station, advance the program to the next station, condemn the station from any future watering times, trigger audible and visual alarm indicators. Programmable flow to enable or disable the flow sensor features. Programmable flow sensor pipe sizes for standard Rain Master flow sensors (1.0, 1.25, 1.5, 2.0, 3.0, and 4.0 inch). Non-standard pipe sizes are also programmable. Inputs for connectivity to a flow sensor. The controller shall read the frequency of the sensor by sensing each time a contact closure appears at the input. The controller shall source +8 VDC to the sensor. Programmable main line flow limit from 1-999 GPM defines the maximum allowable flow during scheduled irrigation. Programmable unscheduled flow limit from 0-999 GPM defines the maximum amount of flow which will be tolerated during unscheduled irrigation periods. Automatic detection of unscheduled water flow. Upon detection the controller shall: energize the normally open master valve (if selected), condemn any future start times, trigger audible and visual alarm indicators. Programmable station upper flow limits from 0-500 GPM. Programmable flow check delay between one and six minutes (one minute increments). This delay allows stations to stabilize each time a station is turned on/off before limit checks are applied. Automatic monitoring and display of measured station flow in Gallons-Per-Minute (GPM) from 0 to 999 GPM. Controller utilizes automatic LEARN mode for setting individual station flow limits for the entire controller. A global percentage adjustment from 5% to 80% is used to automatically factor upper flow limits for all stations once the nominal values have been measured. Single station flow limits can be setup based upon the measured nominal flow or a manually entered value (0-500 GPM). Intelligent upper-limit processing for concurrent station operation. A water usage meter indicates total water used by the controller. The water usage meter can be reset at any time. Ability to enable or disable ET processing on a per program basis. The ability to input and store Historical ET data on a monthly basis (12 months); the data is based on a daily average, at the geographic location of the controller. The ability to store an ET reference value. This value is used during the adjusted station runtime ET calculations. The ability to automatically re-compute the user entered station runtime, at the moment of irrigation, utilizing the current ET information. The station runtime is evaluated and adjusted based on days since last irrigation. The controller automatically compensates for changes in weather patterns between irrigation days. Accept a manual operator entered weekly ET value. The manual entry will override previous entered or accumulated ET data. At the end of the seven day period the controller will automatic revert to utilizing Historic, device, or Internet provided daily ET data. Connectivity to an ET measuring device such as a Rain Master Weather Station. The controller shall record .01 of an inch (ET ) each time a contact closure appears at the input. The contact closure shall be between .2 seconds and 2.3 seconds in duration. The controller shall source +5 VDC to the device. The ability to display the last ET daily value including the source ( historical, measured, manually entered, or Internet ). Ability to display the current adjusted runtime as a percent of the base runtime for all ET enabled programs. Ability to connect to a Rain Master communications card (iCentral) to provide connectivity to the Internet. Ability to connect to a Rain Master Flow sensor or other flow sensor device. Built-in remote control capability for compatibility with all Rain Master remote control systems. Connectivity for any one of the following: rain, freeze, or moisture sensor device. The enabling of this device can be performed on a per program basis. This feature allows non-irrigation programs to execute independent of this device. Availability in a variety of enclosure options including: standard cold rolled steel enclosure with power coat paint, extended size cold rolled steel enclosure with station screw terminals, extended size stainless steel enclosure with station screw terminals. Standard size enclosure: heavy duty 18-gauge (jet coat®) steel enclosure with power coat paint suitable for either indoor or outdoor environments. Extended size enclosure: heavy duty 18-gauge (jet coat®) steel enclosure with power coat paint suitable for either indoor or outdoor environments. Also available in stainless steel. Outdoor pedestal mount available for standard enclosure models. UL, C-UL, and FCC approved.